I obviously could not come up with a better title of this bad boy.. Besides that, hello everyone!! I hope you're all doing well!! These are the gems I used. Of course I forgot to snap a photo of another child.. But, you're all pretty familiar with him.. Anyways, these kids are: OPIs: Shorts Story, A Grape Fit, Ogre-The-Top Blue & No Room For The Blues. I also used CG Liquid Leather. Technically I should have used the sponge technique to make this look even better, but I just painted them on.. No fuss! Speaking of my 'bff' (I use that term in quotes as, well, we ARE, but I need to find a better term for it..) - she has been working crazy amounts of overtime, so she got yesterday off.. Mondays happen to be my Saturdays, so I got to spend the whole day with her! It was awwwwesome! Of course we went shopping. 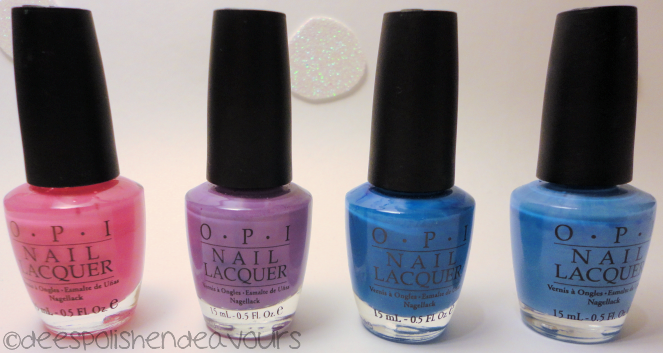 I will show you the non-nail polish goodies I bought (look for the nail polish bad boys in an upcoming post..) - If you are strictly all about nail polish and do not wish to look at anything but, you can close up the window now.. BUT, I have a huuuuge love for nail polish and an almost equal amount of love for other cosmetics (make-up, bath and body products, etc).. I think most of us do, but hey, some don't! Onwards we go.. I will start with the bath/body goodies.. 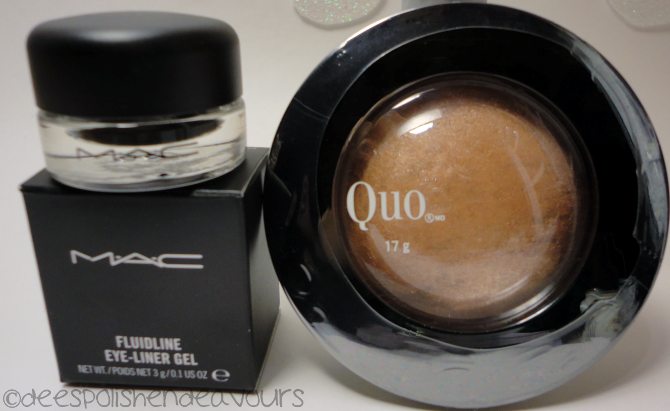 I went to two 'rival' shops.. For a few reasons.. I used to have serious issues with scents.. I still do, but I can handle more now.. Little bits at a time.. Anyways, we stopped in at LUSH and for once the store wasn't extremely overpowering in its scents - win! I really wanted to get a lip scrub from them as my lips have been peeling a lot, and I don't help as I bite them constantly. The items are: Dragon's Egg bath bomb that smells AWESOME! Sweetie Pie Shower Jelly (it smells like jube jubes!! ), Bubblegum Lip Scrub and a Charity Pot lotion.. Notice how I went for one thing and came out with more. I'm such a sucker. Oh, the Sweetie Pie Shower Jelly is amazing! So is the lip scrub.. Tested them both out last night. I also wanted to quickly stop in to The Body Shop.. I was visiting the shop that a friend works in the other day (I wanted to get a candle.. and I get an awesome discount!) - as I was leaving, I noticed they had a new scent (at least to me..) LEMON! I am a sucker for lemon scented items. Of course it would be 4 bottles for $16, so you're getting 50% off. Done. I snapped up Sweet Lemon, Pink Grapefruit, Satsuma and Strawberry. All of them smell fantastic! I didn't see my good pal Raspberry in there.. I hope it wasn't limited edition.. I will have to ask my friend!! Anyways.. 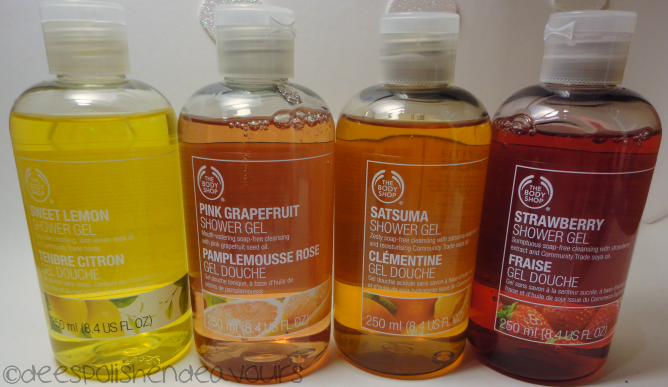 I love the shower gels.. They smell amazing and leave your skin nice and quite soft. Also, while we were out.. I needed to stop at the MAC counter. The other night I used some of my Blacktrack fluidline.. I hadn't used it in a long time.. And I think it might be 6-7 years old.. Yikes! Time to replace. I was good there. That is all I bought. Then, later in the evening, the mother wanted to do a quick Shoppers run.. That is never a good place for me. I always buy some type of cosmetic. I have been wanting to get a bronzer as I do not absorb any colour during the summer (ok, maybe a shade darker.. and by darker I mean pinker).. I of course loved this one..
And that is all for today.. I hope everyone is having a terrific Tuesday! I shall talk to all of you sometime again during this week!! Claire - Aren't they adorable!? LOVE them also. Thank you!! Doo - Your orange franken is sooo lovely! 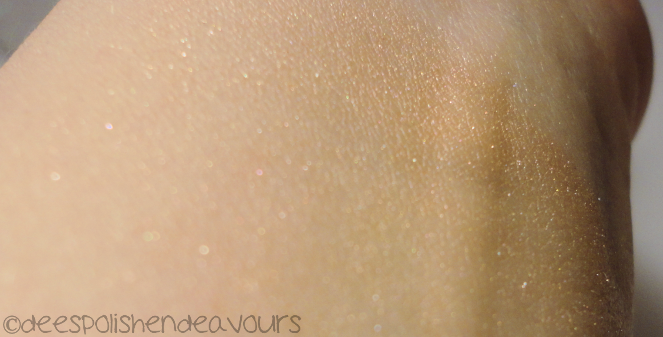 I love the holo action to it!! I actually think the one you made is closer to what I wanted!! It looks so awesome because of the lemons.. That is my story and I'm sticking to it!! I did almost the EXACT same mani last week! The only thing I had that you didn't was the silver glitter. Our brains must be hard-wired with Rebecca's. 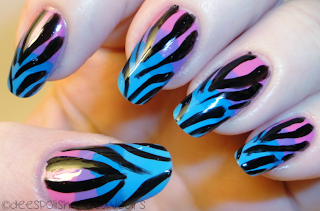 This is on fire <3 I love zebra and I love the tip blue and the pink *drools* GREAT JOB! I loove the Zebra Nails! !